The odds of having your home broken into are higher than you might think. In 2015, there were 1,579,527 home burglaries in the United States, equivalent to 527.9 burglaries for every 100,000 people, according to the Federal Bureau of Investigation. 71.6 percent of these burglaries involved residential properties, and burglaries accounted for 19.8 percent of all property crimes. The average loss per burglary was $2,316, and total losses added up to $3.6 billion. If you’re a homeowner, it’s worthwhile to invest in securing your property against burglary. Unfortunately, many of the security measures homeowners take don’t really work. Here are some of the most common security measures that can give you a false sense of security. You’ve probably heard the popular piece of advice about leaving your lights on when you’re out to fool burglars into thinking you’re home. Many people use automated light timers for this purpose. Unfortunately, experienced burglars know about this trick, so it doesn’t necessarily work. Smart burglars plan their break-ins carefully, observing patterns over a period of days or even weeks to see if your lights are on constantly or if they always go on at the same time, explains home security provider Emergency Systems, Inc. Some burglars who have been interviewed even say that a combination of lights on and the blinds closed makes a home a more inviting target. However, most burglars say they will avoid breaking into a house if they hear a radio or TV on. Burglars have also said that a car in the driveway will lead them to believe that someone is home. Another common mistake is posting a sign that mentions the name of the security company you use. While alarms can be a deterrent, many burglars are familiar with common alarm systems. Posting the name of your alarm provider can tip them off to the type of alarm model you’re using, giving them the information they need to know to bypass it. You’re better off posting a generic alarm sign that doesn’t identify the name of your security provider. A visible security camera can also be a deterrent. Most people assume that they’re safe from being burglarized when they’re home. But a Department of Justice survey found that nearly 28 percent of burglaries occur when someone from the household is present. In over 7 percent of cases, a household member becomes a victim of a violent crime committed during the burglary. 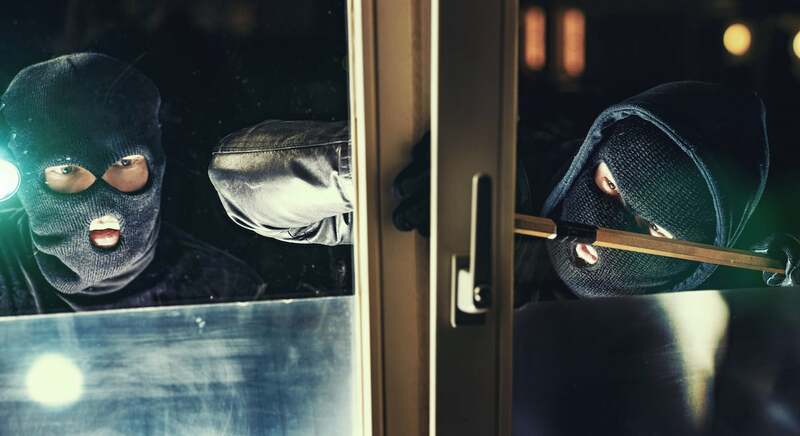 You can be especially vulnerable to getting robbed while you’re home during the day since thieves prefer to break in during daylight hours when they assume most adults will be at work and kids will be in school. Leaving your alarm on even when you’re home will help you avoid break-ins during all hours. Another common mistake is hiding your valuables somewhere in your bedroom, such as in a nightstand, in a dresser, under the mattress, in a closet or under a floorboard. Most thieves look in the master bedroom first and then work their way through other rooms in the house. Experienced thieves look everywhere in your house, even in places such as bookshelves, toilet tanks, and food cupboards. You’re better off storing your valuables in a strong lockbox or safe. Since most burglars work quickly and leave within 10 minutes, you might consider using a decoy box or safe with fake jewelry in it and leaving true valuables in a second, hidden container. If you sometimes leave your wallet or credit cards at home, make sure you protect yourself with an identity theft service. Identity theft services, such as LifeLock, cost significantly less than the financial damage one single act of identity theft can do. In 2014, identity theft victims reported an average loss of $7,761 to the U.S. Department of Justice. Identity theft is the most common type of theft today, affecting 13.1 million Americans in 2015.